I am so honored to have been chosen to run the Boston Marathon for the Credit Unions Kids at Heart Team and am excited to begin fundraising for Boston Children's Hospital. The first time I had the privilege of meeting my patient partner Maddy, I was in awe and immediately inspired. I left thinking, “Does she ever NOT smile? 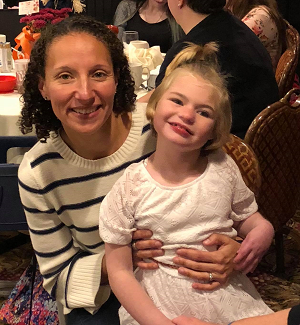 How could someone who is faced with so much adversity always be so happy?” When Maddy was an infant, she became unexpectedly ill and was diagnosed with meningitis. As a result, she developed cerebral palsy and is faced with serious lifelong health issues. Despite all of this, at just 8 years old, she has already defied the odds and hit milestones her family was told she would never reach. Her family attributes much of her progress to the amazing care and advanced medical resources she receives at Boston Children’s Hospital. CU Kids at Heart contributes 100% of the monies raised to medical research at Boston Children’s Hospital which help children like Maddy. The CU Kids at Heart team work together with scientists and doctors to fund research aimed at preventing, treating and curing pediatric neurological diseases, such as Cerebral Palsy, Moyamoya, Sturge-Weber Syndrome, Epilepsy and Pediatric Brain Cancer. Last year the team raised a record breaking $460,000, every single penny of which went directly to funding pediatric research. I am proud to be taking this journey with my patient partner, Maddy. Her smile is infectious, and she is an absolute joy to be around. The strength and courage she, and her family, display in the face of daily challenges are an inspiration to everyone they meet. She will surely motivate me as I take each step of those 26.2 miles on Patriots Day. I am incredibly grateful to be a part of this team and to play a part in helping raise money for life saving research at Boston Children’s Hospital. Please support this wonderful cause and donate today!